YES, I am spamming this forum with maps. And YES they are not original just conversion of the maps I miss from UT (sadly the timing in UT is all wrong on my new computer). This is based on the spacemap DM-1on1-contact. I have the same problem as Paradise: The ground ends to suddenly. Also I really don't want it to be in lava I want it to be in red fog, but then I try to place it in red fog, the fog looks massive until you fall in it and it still have edges! If anybody have the solution I would like to know. EDIT1: Updated to Alpha2, small modifications: Weapon pick-up-things, different weapon placement, mesh art and lights. Bots are now very stupid. EDIT2: Updated to both Beta1 and Beta2: Like alpha2 but bots are a little less stupid. Beta2 is darker and the bots are stopped from doing even worse things. EDIT3: Updated to final. Changed to fit 0.7.x. It might be possible to optimize but its not going to happen. EDIT4: Updated the links to old server. I think the only solution to water/lava edges, is to use a fog. A fog that doesn't look obvious on the overall map but blurs out the water edges. It will most likely require a specialized fog texture. And a lot of testing. You've got a shadow that shouldn't be there (see screen shot). Make it into a decal (in gtkradiant, put the texture on a patch, fit it to size, and with the patch selected: right click > _decal ) then target a target_position with the _decal. On the fog play around with the surface inspector stretch or shrink the texture to your needs (also play around with the different fogs). looks like a relatively good layout. simple, yet effective. i'll be looking forward to it. I release beta1 and beta2 simultaneously since they both have certain strengths (and I never really got beta1 out before I got to knew about botclip). Beta1 is like alpha2 just with slightly smarter bots. They still have a problem with not being able to jump correctly between platforms. It sometimes succeed though so it is kind of ok in a way. Beta2 is using botclip to stop bots at certain places there they think they can jump. Bots still jump a lot. This is darker properly due to a change in shaders (maybe because I finally got my shaderfile updated). Sarge removed from the default bot roam as he was significantly more stupid than the others. I don't expect to update the maps soon... they are kind of the way I intend them. Although I have given up on mapping I thought I would just release a final version since its now playable for people without the SVN version. Thanks sago007, this looks like it could be some fun. Downloading now! This can be a great space map. Did you thought about it? I've played a bit and found it as a good replacement for void4 in the SP. 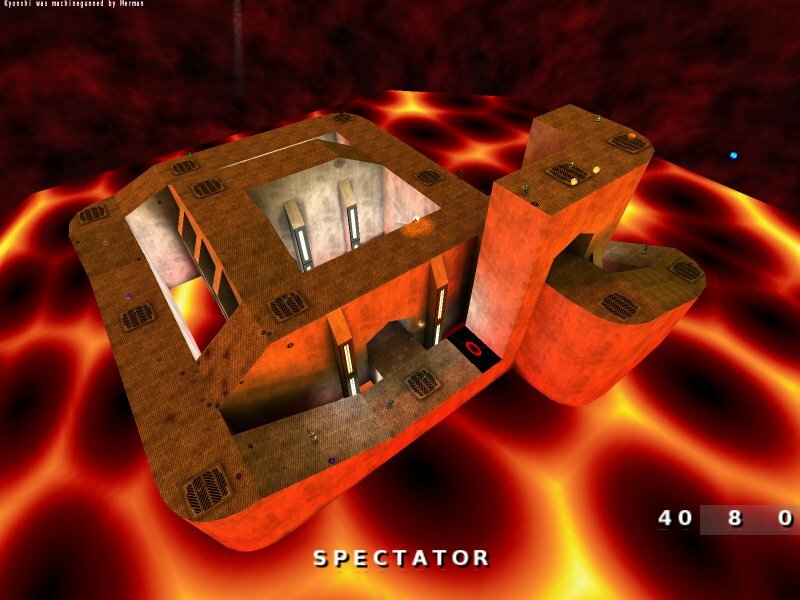 Also, I loved Contact on UT & UT2004. Took this map and tried to shift its look. Here's the first part of the process. I'll be updating it. There'll be a new item/weapon placement too. I'll be including the Personal Teleporter somewhere too. I want to include oa_ctf4ish skybox too. ATM there's no download. The only complication I had so far is that my PC freezes in the -light stage of BSP, (I have the same problem on q3dm6ish-ctf) I had to enable -nocollapse to get lighting working and compiling well. Here are the screenies. Nothing to download ATM. Nice work. Cool lighting. Like the details I can see so far. Dunno if you altered the base wall texture. I dont think so but without the red light it looks very repetitive. Same goes for floor texture. 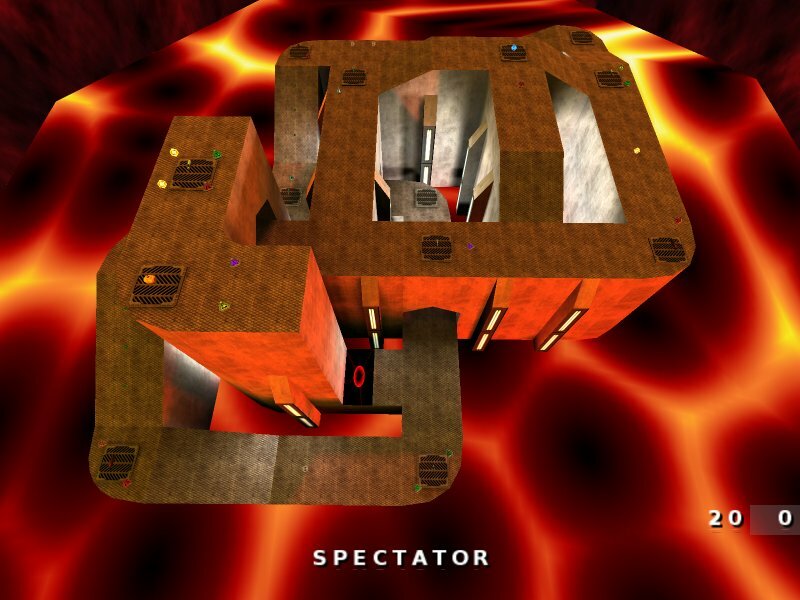 AND WHERE IS THE RED LAVA??? <-- Important!!! i think it looks better as a space map than a lava map. Exactly, that's why I've done the map that way. The original ones are, in fact, space maps. @cosmo: I didn't altered nothing, except that I worked with the new shaders (sorted by folder) instead of the ones which came with the game. - Layout untouched. There's a secret made by sago himself that I didn't touched too. Only replaced the goodie it contains. - Detail all over the level. The light spots are models. They can be used in many maps and have their own utility. - Item/weapon placement entirely redone. Weapons: Shotgun, Rocket Launcher, Plasma Gun, Railgun, Lightning Gun, BFG10K (teamed with Flight, 45 sec. of respawn the team) and Nailgun. - Powerups & Holdables: Flight (teamed with BFG) & Personal Teleporter. They're not so easy accesible tho. For those who doesn't like space maps but like am_spacecont, here's a new mirror.